In addition to the variously named Sun Ark improv zoners that surfaced last week (from both Sun Araw/Cameron Stallones himself and pal Barret Avner), this new 7" sees Sun Araw "radiating love for the homeland" in a typically heady mode. This one's especially celebratory, channeling his now-familiar dub, soul, and blues voyages into some sort of gritty West Coast canyon worship. The B-side gives Teenage Fanclub's "December" a similarly ecstatic bump. Also, heads up: it's all still in the works, but Sun Araw and M. Geddes Gengras (who has a couple of new synth tapes out) will be bringing their WHERE'S YR CHILD club night to NYC in early June. 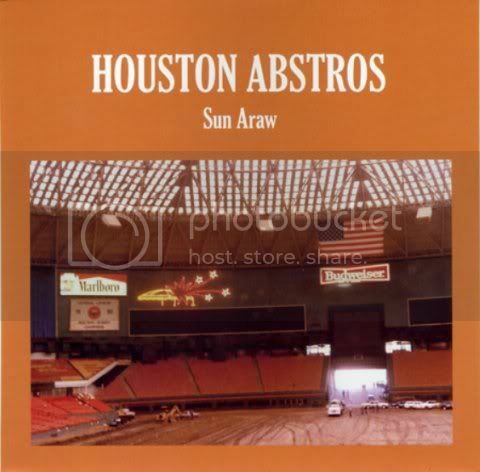 Grab the Houston Abstros 7" before the 300 run out from Monofonus Press.